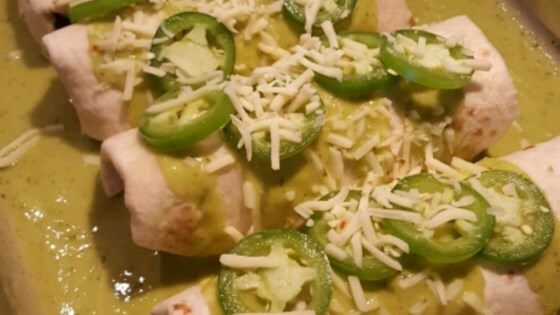 "One of my favorite local Mexican restaurants serves a dish with jalapeno cream cheese and shredded chicken that is to die for. I had been experimenting with dishes that contained those two ingredients and came up with this!! It is absolutely to die for and I get nothing but rave reviews from people who try it! Give it a whirl... I promise your taste buds won't regret it. :-)"
I took the meat off of a rotisserie chicken from our local deli. I also added a few ounces of sour cream to the filling. It was amazing! Can't wait to make it again. These enchiladas were amazingly good. I stuck to the recipe and made it exactly as written. Definitely a keeper!